When I got my iPhone 5S, I didn’t realize that Globe didn’t send me an LTE-enabled SIM. I tried to get it replaced the other day, but there weren’t any SIMs available at the business center in Podium, and when I went to the one in Robinson’s Ermita, the system for SIM replacement was down. So I went to Robinson’s Ermita again today to see if I could get a new one. The guard warned me prior to giving me a queue number that the wait was long because there were 11 people ahead of me. I figured it would take an hour, maybe 2 hours tops to get to the front of the line. I was so wrong. After waiting for an hour, the queue number hadn’t changed. So I hung around the Express Service counter, hoping I could get some help. Guess what? I was so wrong AGAIN. The person at the counter wasn’t servicing the Express Service counter. He was handing out new iPhones to new accounts. And doing ONLY that. When I asked if I could get my SIM changed, he said, “Do you have a number?” I said I did. He then pointed to the signs “That’s why it says ‘Next Counter Please'” and that I had to wait. This is the kind of service that wins awards? The Express Service counter being used as an extra area to release new iPhones instead of what was listed behind the agent. In case you can’t read it, it says “Change SIM, Prepaid Purchases, How to”. When I asked a different person if the number I got today would be honored tomorrow, the answer was a big resounding “No.” I just had to leave in disgust. 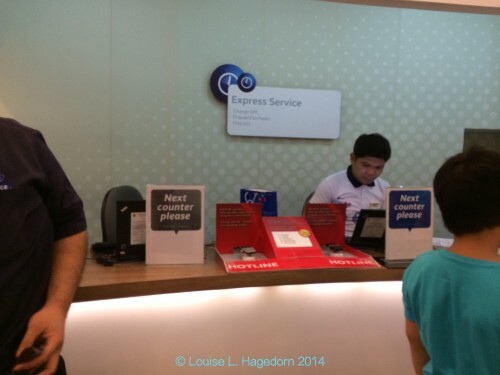 I went Greenbelt to see if their Express Service lane was better. It was a whole lot better. There were two agents manning the lane. They were polite, helpful, and knowledgeable. The Greenbelt Business Center is about twice the size of the Robinson’s Ermita Center. There were also servicing at least three times the number of customers. But they were doing a better job of it. That’s what made it so frustrating. A bigger center means more complicated logistics, and yet, they were doing their jobs more efficiently. I don’t know what the difference is, but Globe’s Greenbelt Business Center is the kind that wins awards. Globe’s Robinson’s Ermita Center just shows you how far they have to go.